Juicing: An Integral Part Of Cancer Prevention Diet! While there is life – and plants – there is hope. Vegetables and fruits are a blessing of the plant kingdom. We keep hearing of “natural cures” for diseases, and it is incredible what may be accomplished by abandoning all processed foods and meat in favor of vegetables and fruits. Wonderful cures are attributed to the adoption of a vegetarian diet in cases of cancer, tumor and all other complaints, including wounds that refuse to heal. There is a lot of talk nowadays about “returning to Nature,” but most of us are so used to our synthetic lives, that simplicity spells increased complexity. The “vegetable cutlet” costs us more than double the time and effort involved in preparing its fleshy namesake. Exercising is infinitely more troublesome than reaching out for the prescribed doses. But return to nature we must, and vegetables come to our rescue yet again, now as part of cancer prevention diet. We are well aware of the enormous benefits of vegetables. When eaten raw, the biggest health benefit vegetables offer is cellular cleansing, which keeps cancer cells away. They also have detoxifying, energizing and rejuvenating properties. But at least 2-3 cups of a wide variety of vegetables are needed for the human system to get all the essential nutrients they have to offer. Many of us do not consume enough vegetables to take advantage of what they have to offer. Our ancestors squeezed the liquid from plants for healing purposes, but the health benefit of vegetable juices was understood only in the 20th century. Vegetable juices can be prepared very easily at home using a variety of vegetables. All the nutrients, vitamins, minerals, enzymes, protein and fats can be easily absorbed by the body. This forms a crucial part of your cancer prevention diet. 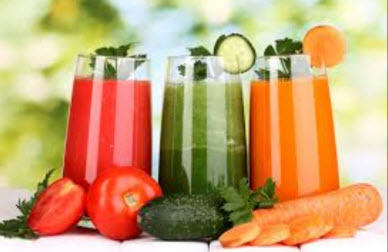 It is easy to drink two glasses of vegetable juice daily. These vegetable cocktails contain healthy micronutrients, very few calories and no dietary fat. Our internal body systems thrive on juices, resulting in optimal health and vitality. Since the sugar percentage and calorie count in vegetables is much lower than fruits, juicing stabilizes blood sugar levels. People on vegetable juices also experience a healthy weight loss, as vegetable juices increase the fat burning hormones in the body. The body’s pH balance (acid/alkaline balance) is essential for good health and vegetable juices help maintain a healthy balance. If the pH balance is not proper and acidity increases, it can lead to lots of health problems. Your body loses the power to absorb essential vitamins, minerals and other nutrients to repair damaged cells and to detoxify heavy metals. This leads to the multiplication of cancer cells. And cancer prevention diet allows no room for error. Which Vegetables Are Best For Juicing? Almost all the vegetables can be juiced. Using a wide variety of vegetables helps you get the benefits from diverse nutrients that are an essential part of a cancer prevention diet. Some of the vegetables that are excellent for juicing are broccoli, lettuce, parsley, chard, kale, carrots, beetroot, pumpkin, squash and parsnips. For optimal health, make sure you add plenty of leafy greens to all vegetable juice combinations. For exotic flavouring, add natural herbs like mint, parsley, root ginger or dandelion. Citrus fruits like limes or lemons can add that zing to your vegetable juices and they offer excellent anti-cancer properties. If you are willing to turn your vegetable juices into health-fuel, get deeper into the health mode and grow a small kitchen garden of wheat, coriander leaves, mint, rye grass, barley and add a handful to your juice. First things first – say no to canned juices. Scrub and clean all vegetables with warm water before juicing. A little water can go a long way in removing unwanted microorganisms. Vegetables like tomatoes, avocados, peppers, eggplants, lemons, limes, cucumbers and oranges are usually waxed. Since water does not clean the wax, you should peel the skin off. If you can get your hands on organic produce, you will not have to worry about all these problems. Another essential aspect of juicing is your juicer. You have to ensure that it is washed with warm soapy water after every juicing session. Clean the strainer with a bristle brush to remove any vegetable particles stuck to it. Never leave the vegetable juices standing without a lid for long. It is best to consume vegetable juices immediately upon processing. But if lack of time is your concern, refrigerate the juice in a tightly sealed container, to reduce nutrient loss. While juicing is a brilliant tool that helps you stay healthy and an invaluable part of cancer prevention diet, it is not the Be All, End All to staying healthy. Juices do not contain protein and fiber that is essential for the body. Continue to eat whole vegetables, cereal, breads and grains. Make sure you balance your juicing with whole foods for optimum cancer-proofing.